Findings from the Wilden Living Lab so far. The majority of people are aware of the hot and sunny days in Kelowna that makes the city and the region a great place for solar based energy generation. 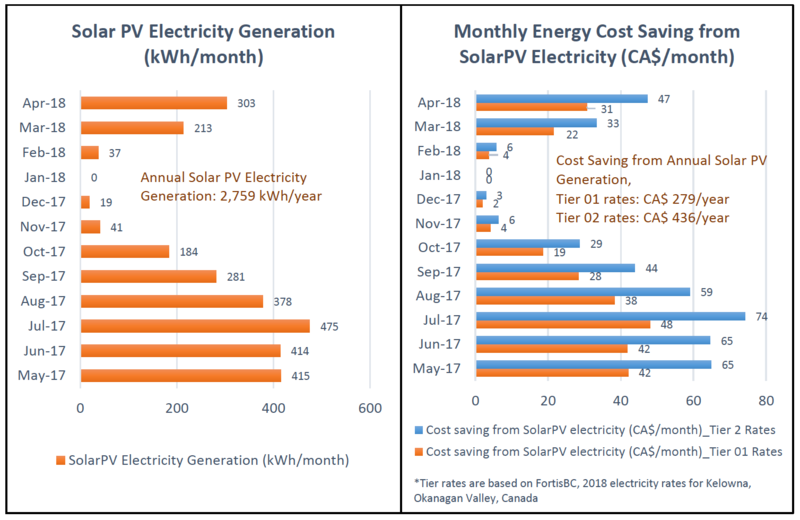 Yet, there’s another less well-known reason why Kelowna and the Okanagan Valley need to consider electricity generation using solar photovoltaic (PV) systems. Over the last decade, electricity rates have increased on average by 7.7% per year (Ross McKitrick and Elmira Aliakbari, 2017). Given the need to maintain the current electricity infrastructure and the cost of new generation, electricity prices will continue to increase in future too. Imagine what the costs of electricity will be in 2030!!! A home solar PV system can provide you with the security of low energy prices for a longer term. Aside from the upfront system costs, you are able to produce free energy for up to 30 years, or even longer. Electricity generation using solar PV offers considerable benefits compared with the fossil fuels (such as natural gas, coal and oil); that include reduction in your environmental footprint, raise in the value of your home, financial freedom from constant energy price increase to name a few. Does Solar Make Sense for You? To observe the practicality of solar PV systems for single-detached houses in the Okanagan, we installed a solar PV system (HES-260-60P HES PV) in the Wilden Home of Tomorrow (HOM). Based on the real-time data collected from the monitoring system, the annual solar (PV) electricity generated from May 2017 to April 2018 can be shown in the graph below. The graph indicates variation of energy generated per day by HOM. The maximum energy generated by the solar panels is from March to November. In summer, as a result of air conditioning, the household electricity consumption will increase and additional electricity costs can be incurred. In those situations, a solar system can offset these additional costs and prevent consumers from consuming expensive energy blocks. During the winter season the amount of sunlight is comparatively less and also the solar panels can be covered by snow. This may reduce the electricity generated from Solar PV in winter. If you were to amortize the cost of a solar power system over its 25-30 year lifespan you would be paying approximately 10 cents per kilowatt hour, which is the lowest price we currently pay for electricity on the grid. However, the capital cost (upfront cost) of the system will likely decrease over that same period making the actual pay-back period shorter than the above. Lower upfront costs in solar systems would result in even greater growth in solar PV systems in Okanagan in future. It should be noted however, that additional costs can be expected for solar system maintenance (replacing inverters, cleaning) and panel degradation. In 2015, the Canadian residential sector contributed to 14% of the national GHG inventory (Natural Resources Canada, 2016). An average household’s energy consumption is calculated as 0.79 GJ/m2 (Survey of Household Energy Use 2011). For those living in single-family detached houses, this number is significantly higher. According to the figure below, the electricity generation using Solar PV has higher emissions (Considering cradle-to-gate emissions of solar panels and other fuels) than the electricity generation using wind, hydro and nuclear. However, Solar PV has significant emission reduction compared to the energy produced by natural gas or coal. Accordingly, the good news is consumers who are using fossil fuels to produce energy can drastically reduce their household impact on the environment with a residential solar PV system. Solar energy is “green” partly because of its ability to generate power while giving off zero emissions. Stay posted for more real life data results in the future. In next month’s issue we will talk about energy and cost savings associated with different water heaters! Hi. Thanks for this. Very interesting. What discount rate and cost of capital and inflation rate have you assumed in this analysis. Have you included taxation impacts and solar operating costs and maintenance and considered any differences in tariff rates for solar connected housing? Would you share your analysis? The discount rate was assumed as 2% per year. The study has been conducted for 5%, 3%, 1% and 0% electricity tariff increase rates with tier 1 and 2 rates provide by FortisBC (domestic electricity rates for Kelowna, BC). The corresponding results are given in the article. The capital cost of the solar system was considered as CAD7,500 which was based on the supplier’s quotation provided in 2018 including equipment, installation, taxes etc. However, this data has a higher uncertainty where there are location, project, supplier-specific rates can be found. Please advise the optimum size of solar installation. Thanks. The optimal solar panel size depends on several factors. The key optimization factor is the roof area. For an example, for 5kW solar system, 25.5 – 34m2 of roof space is required to install 15-20 solar panels. Therefore, the space optimization needs to be done according to roof design.